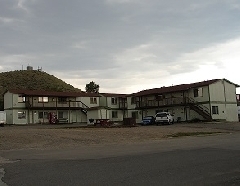 The motel is situated overlooking Meeteetse and the Greybull River basin with views of the Absaroka Mountain range. See the country where the cattle barons and outlaws once ruled! Extensive remodeling and upgrading of all the beds and furniture has been done. There are non-smoking and smoking rooms, two room suites and standard rooms. Most have kitchenettes and standard rooms and have a microwave, coffee pot and refrigerator. Kitchenettes have stoves, refrigerators, microwaves and coffee pots. The rooms have telephones and cable TV. Two Room Suites have one king, one or two double beds, or a sofa sleeper. Standard rooms have one or two double beds or a queen. Open year-round. Pets welcome. For reservations please call the Oasis Motel in Meeteetse.